Bringing home the harvest together. 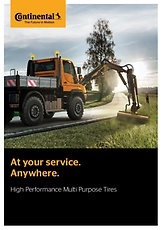 With tires you can trust. We share the farmer’s passion for soil because our tires touch it all day, every day. Every farmer has something that makes him special. With their patent-pending N.flex© technology, Continental tires are unique too. At our high-tech plant in Lousado, we’ve developed a new type of nylon carcass that makes our tires more robust and round. 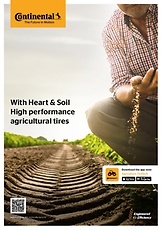 In view of the growing world population and the increasing need for agricultural crops, the number of large-scale operations and therefore the demand for efficient agricultural tires is increasing. This is where we have many years of experience as a premium manufacturer. They are especially designed for mixed on-/off-road use with a strong emphasis on tough conditions. The flexible carcass and the wide inflation pressure range allows for both high speed on-road and rough-ground off-road operations.